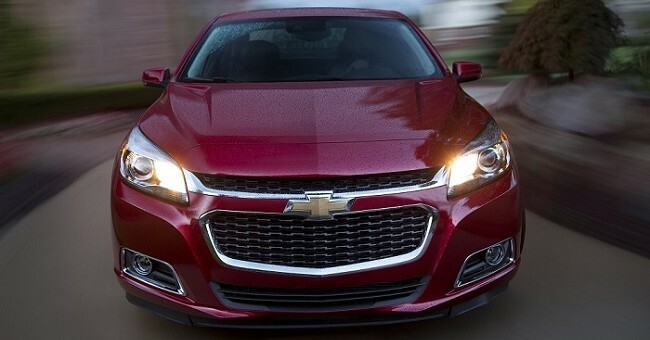 If you’re looking for a killer lease deal, why not consider a 2015 Chevrolet Malibu 1LT at just $189 per month? So says Edmunds, who listed the 2015 Malibu as one of their top picks for the best December lease deals at or under $200 per month. Of course, they referred to it as a “1LX,” which is not a thing – least aways not a Chevrolet thing – but no matter. The 1LT trim level is just a step up from the base LS, so you’re getting the same 2.5 liter normally-aspirated four-cylinder, rated at about 196 HP. But that’s not a bad thing; it achieves a claimed 36 mpg highway, with (says Chevrolet) a full tank range of up to 650 miles. So, the LT1 model is distinguished from the LS instead by creature comforts: better interior trim materials, Ice Blue ambient lighting, Bluetooth, SiriusXM, a 7″ infotainment screen with MyLink, etc. Down payment for the rate of $189 is $1,369, with a mileage limit of 30,000; each mile beyond costs a very reasonable $0.25 per. It just goes to show that in this day and age, it’s always possible to find a good car for the money, no matter what the price point. Previous story How Is The Tonawanda Plant Doing With All This Small Block V8 Production? That’s not a bad deal at all. The car isn’t all that bad either. I don’t care what the naysayers and pundits think. Close but no cigar , let me know when the lease cost is zero and they throw in a gallon of 1% nutritious milk…it’s so good for you , builds good bone structure , and you grin more often . Friends may look at you with concern, but pay them no mind , you are more healthy and have a new car , too boot !! If you get a chance write GM and thank them for their efforts with the Malibu , Lord knows they need the comfort and public support as they prepare to change it yet again , next year . Kind of reminds me of Snow White and the Seven Dwarfs….Hi Ho , Hi Ho , it’s off to work I go , as they repeat the new mantra…gona get it right this time , gona get it right this time………! If you’re going to try and be snarky, you might want to review elementary school grammar and how to use the words to, too, and two. This is one of those good news bad new deals. It is good news someone can get a good lease on a decent car. Bad news is that they are forced to offer this deal to attract buyers. I agree with Paul that his is not all that bad of a car but it is behind the others in class that are a little more on the leading edge of a very competitive segment. I think any understand the truth on this car as it like the XTS were left over products GM invested in so they would have something long before 5 years after the bail out to offer vs. like Chrysler that just finally came out with the 200. The 200 too is a rehashed Lancia and while a much better car is still not class leading itself. Anyways GM will keep the present Malibu alive with good offers and we will see the new one they had planned very soon anyways. Now the next Bu will need to be a no excuse car as they had the time and money to hone this one right. Having been impressed about its looks (best in class IMO), I just had to rent a Malibu during a recent vacation in Florida. -Interior fit and finish on the level of a 1992 Cavalier, with cheap plastic, and loose fitting parts as far as the eye can see. It’s funny you sit here and accuse the Malibu of having a rough Stop/Start system when compared to other vehicles that use it too, but all PROFESSIONAL REVIEWERS say the exact opposite. You’re just a deadbeat fool. Why would anyone listen to you? Also, the 2.5L Ecotec I4 has 196HP and 191LB-FT whereas the 1.5t EcoBoost I4 only has 181HP and 185LB-FT. Sure you have a turbo and the power comes on earlier, but not by much. Lastly, my Malibu had an amazing interior! Granted, I had a 2LTZ and you probably rented a LS or 1LT. I respectfully disagree, except for the looks part (IMO it is best in class there, standing out from the old “shaved-soap school of design” others offer. NHTSA 5-star safety rating in all categories but the rollover, with 4 stars there. Full disclosure: I’ve put 11500 trouble free miles on my 2014 1LT since a June hailstorm demolished my 2011 Malibu (old body style) and get around 25 MPG around town and have achieved the 36 mpg rating on longer trips down interstate roads. My ’11 only mustered 31 mpg highway. The lead for this article suggests this deal for people low on cash. One of the nice things about the economic “recovery” is that used cars from the mid-2000s are finally cheap. You can get a nice Pontiac G6 for the cost of this Malibu’s lease term. You may have miles, but you’ll also have a naturally-aspirated V6 from one of the most durable V6 engines ever built. Ask the many G6 owners in the 300,000 mile club. Go with a six-speed used G6 if you’re strapped for cash… not a lease that you have to hand the keys back on. Just hitting 100k on my 3.5L – no plans to sell. It will be replaced by an Aura XR or a G6 GXP with the 3.9L. This is the car for putting lots of miles on. G6’s and Aura’s were junk. Besides, I’d rather sacrifice 28HP and 28LB-FT for the 2.5L Ecotec I4 and get up to 36+mpg than an outdated 3.5L High Value V6 that barely gets 30mpg. Heck, even my 2.0t with +48HP and +76LB-FT gets 31mpg on the highway!